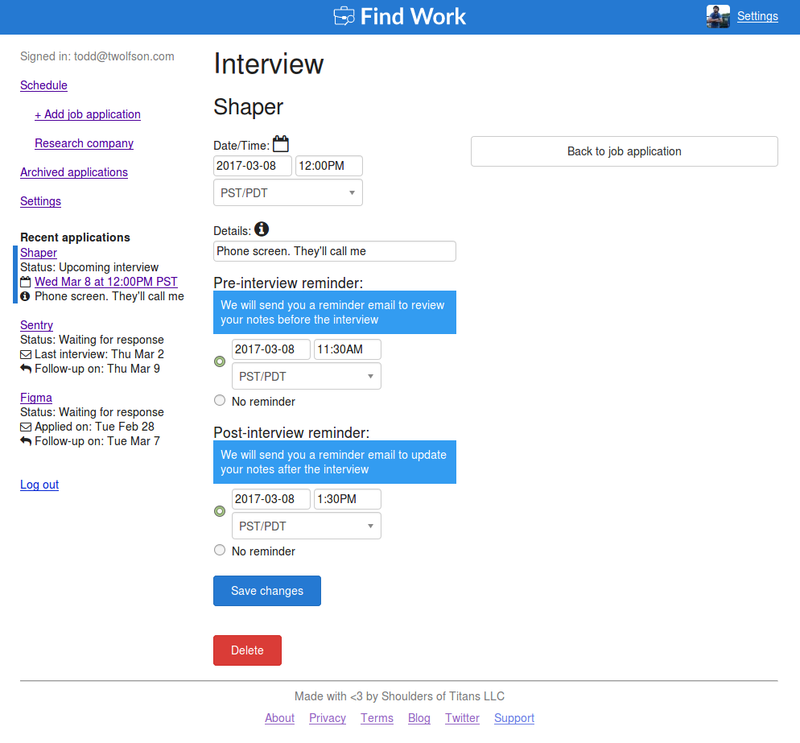 Everyone’s job search is different but I think some insight can be gained (especially for new grads) from sharing our approaches. This article will document my job search from start to finish. Before we can get to the first step, we need to establish what I’m looking for. Next up, we are going to find and save job listings that we think are a fit. It’s best to save them in a single location (e.g. 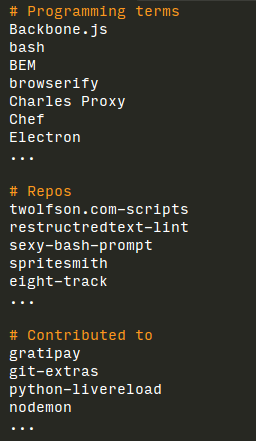 text document, Find Work) as these steps can take a while and be exhausting to do all at once. Most companies have jobs/careers/etc links on their websites. 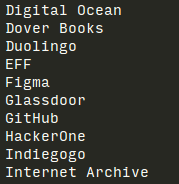 I like to have a long list of companies I respect/would like to work with. Then, when I start my search I go through the list and see if I’m a good fit. 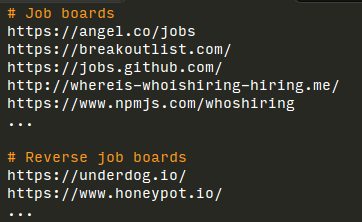 Similar to my company list in the “Direct” section, I have lists of job boards and reverse job boards. For the uninformed, I consider a reverse job board to be something like Underdog.io where you submit your resume and companies contact you. I typically stick to startup focused and/or relevant technology focused job boards to remove unnecessary noise to sift through. Over the course of a career (and maybe before it), we collect a network of people. This includes people we’ve worked with, recruiters/companies that have contacted us, and people we’ve met at events. As with the other sections, it helps if this data is aggregated (e.g. browse through contact list, email folder for people who contacted me). 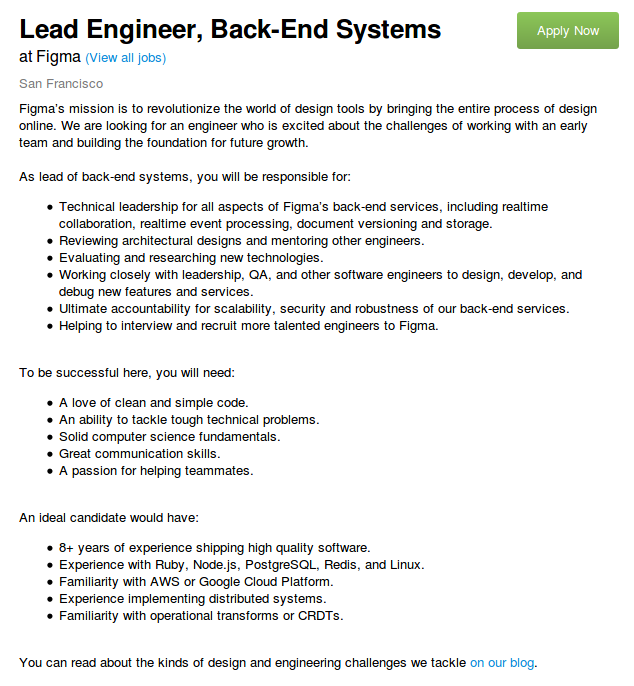 Next up, we take each job listing, do our homework (i.e. research, targeting), and submit our application. Company is doing well without losing too much of their equity to venture capitalists/angel investors (AngelList, Crunchbase). I’ll elaborate on this in a bit. If a company hasn’t had to raise money or raises large sums infrequently, then they’re probably doing good. If they are raising more/less the same amount repetitively, then they could have stagnated and are losing large chunks of their equity. Use caution and ask about this during early stages. Companies get the best terms when they don’t need to raise. Also, you should be aware that employees typically get non-preferred stock which means you can get screwed at IPO/acquisition so be sure to trust your company. Next, we want to give our application the best shot at getting the foot in the door. This means we are going to cater/shape our resume as well as include a cover letter explaining why we are applying/our interest in the company. So how do we build this? 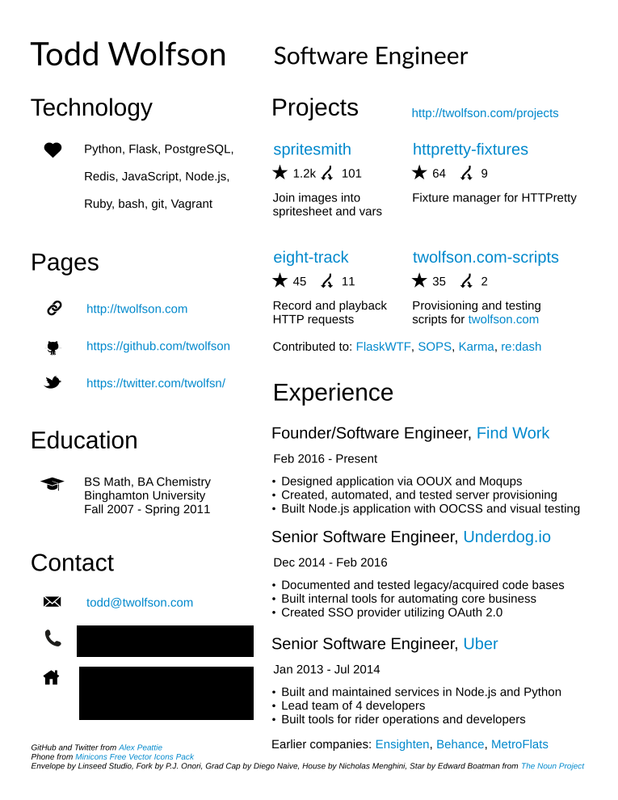 First off, I pick the best layout for the resume. For me, I want to show my design knowledge so I use a typographic grid. For someone in a non-design related profession, then a traditional layout might work better. With respect to cover letters, the intro/outro stay relatively consistent but the sections in between are written from scratch each time (e.g. 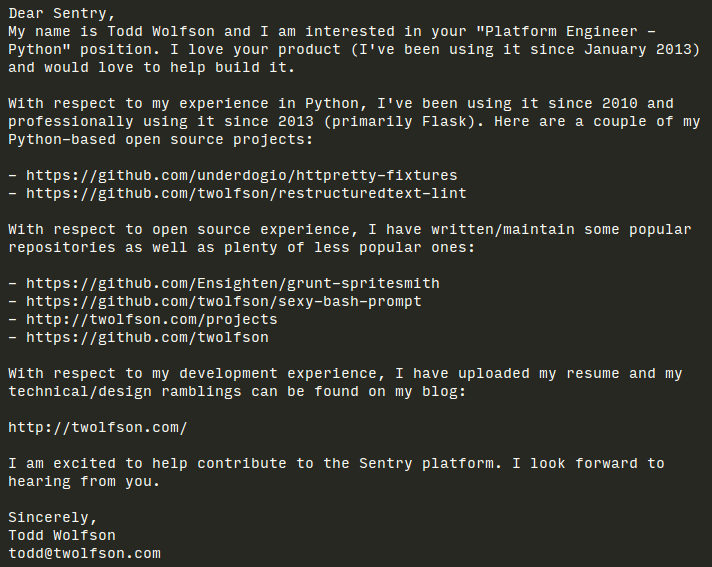 Python experience, open source experience) as every company/job is different. Be sure to save your resume and cover letter somewhere (feature pending in Find Work) so you have a point of reference in the next stage. After the cover letter and resume are completed, submit them and set a reminder to follow up in 1 week. 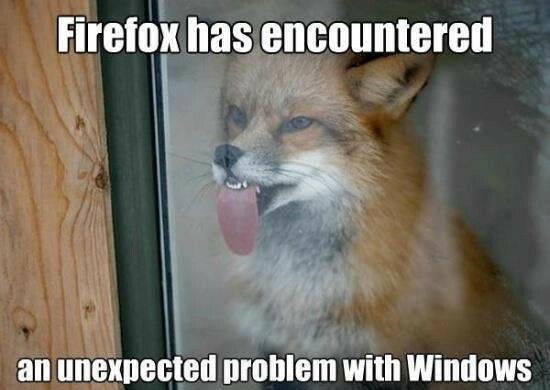 Sometimes, an application slips through the cracks and this helps the recruiter take a second look. 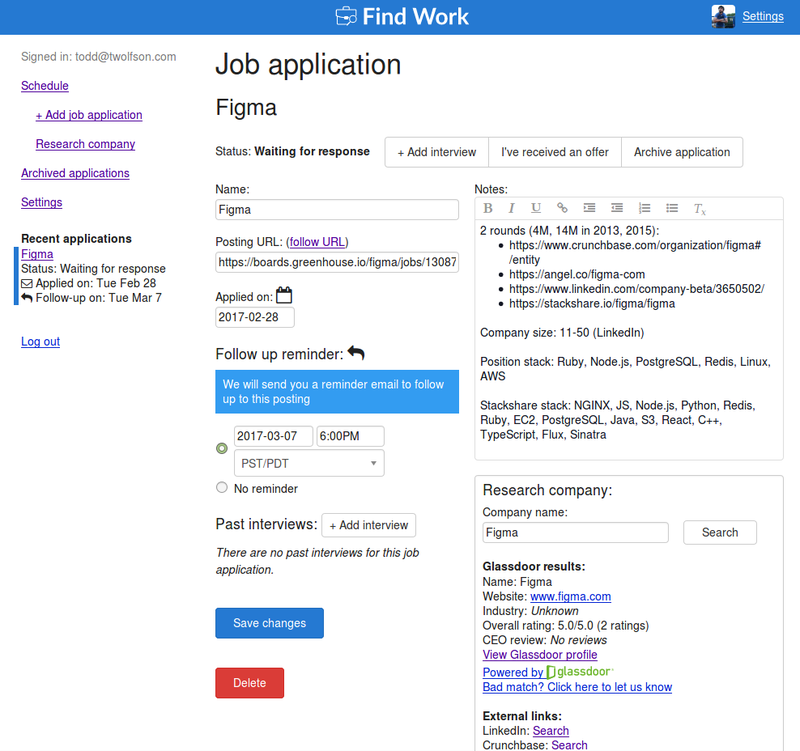 If you’re using Find Work, then the reminder will be set up automatically. 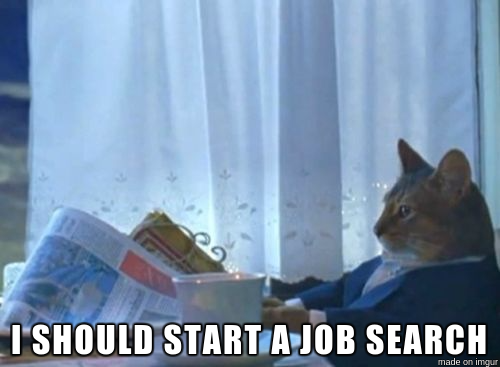 Now comes the longest part of the job search, waiting. I typically will wait for 1 week before following up. Following up should only be done via email so it’s limited to specific applications. We want to avoid things that will upset the recruiter (e.g. resubmitting the same application, contacting support). If I haven’t heard back in a week and can’t follow up, then I consider the application dead, archive it, and move on. I would recommend following up only once, maybe twice if you’re super passionate about the company/role. After that, consider it dead. We have received an email back from the company! Typically, this starts with a phone screen with a recruiter or person in your department-to-be. This step can be a little technical but is mostly to verify you are interested in working with the company and fit the role. 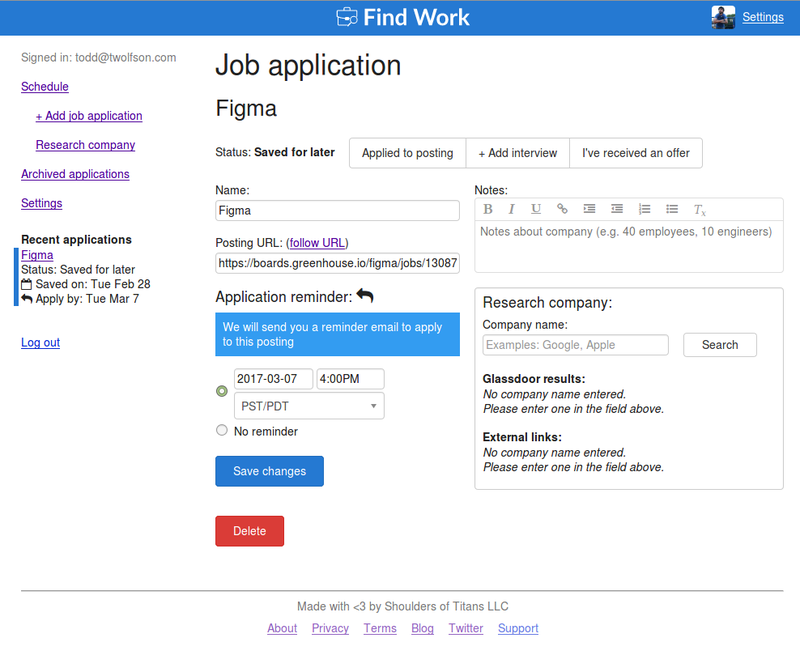 Find Work manages the reminders along side the interview information keeping everything consolidated. Every interview process varies from company to company. Sometimes there’s a coding challenge, sometimes there’s no technical video call, sometimes there’s 1, sometimes there’s 2, sometimes there’s nothing. The rule of thumb is the same — reminder before for preparation/reviewing notes, reminder after for updating notes, follow up in 7 days. This is the final stage of interviewing. You’ll visit the job’s location and interview with the team there. 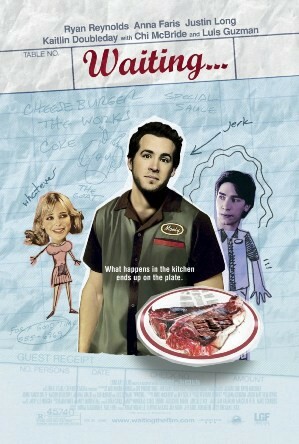 This is to get as close as possible to what it’ll be like when you work there. If you don’t live in the city where the job is located, then you’ll typically be asked to fly out. Once again, as with every other stage, reminder before for preparation, reminder after for taking notes, follow up in 7 days. Additionally, it might be good to think of what you’ll expect to be asked (e.g. salary, theoretical technical questions). At any stage of interviewing, you can be turned down to proceeding further. Don’t take it too personally, try to identify why/what went wrong, and learn from it (e.g. not prepared, bad technical fit). I’ve been rejected from applications (e.g. Khan Academy, Stripe, HackerOne), everyone has been rejected from applications. Looking for work? 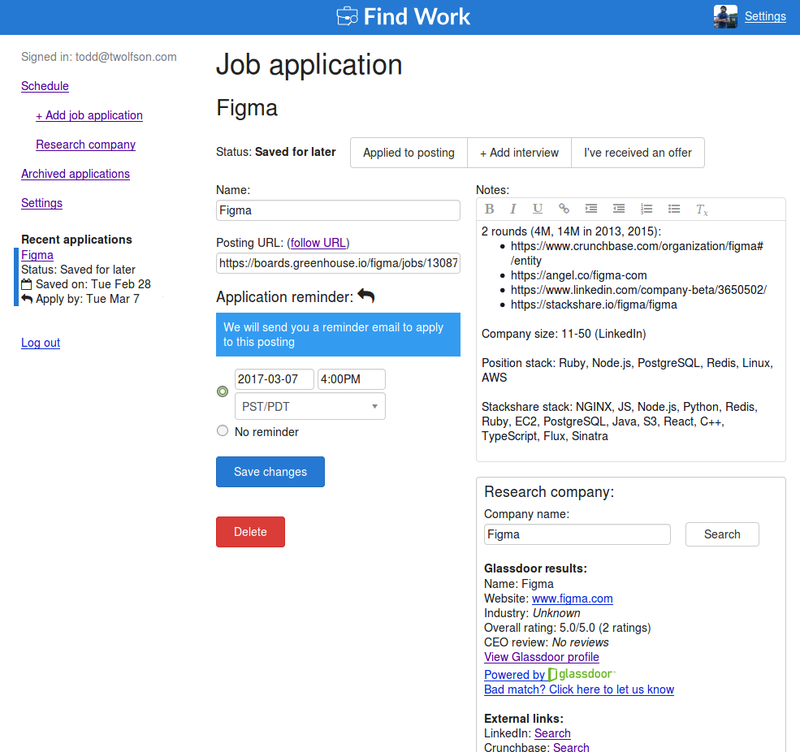 Manage your job search and research companies via Find Work!